Tonight's progress on the penguin army. Six little heads. Darn but I'd forgotten how small and fiddly the head is! And this even after I enlarged the pattern by 50%! I will say that doing them production-line like this has its advantages. The sixth head was a lot easier than tonight's first head. 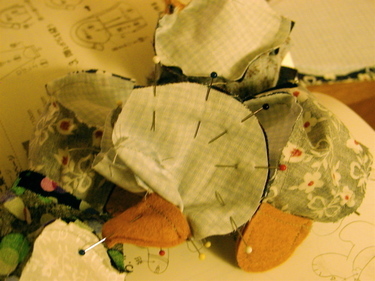 You should have seen the first head, it had about twice as many pins in it. 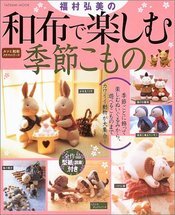 More info about this book here, it's the second entry in the table, "Bunnies." More to come, there are a bunch cut and ready to be sewn. Yes, they're Christmas presents, and I know it's a little late to still be sewing Christmas presents. But if we don't see people to give them their presents until next week, I think I'm still OK. I hope everyone has a wonderful holiday. I was about to say "wonderful, stress-free holiday", but that's probably too much to ask! So far ours has been stress-free by necessity, as Max and I got sick this weekend and have been padding around the house like zombies. Just head colds, nothing serious, but mine won't go away (I'm hoping it's not a sinus infection), so I took 5 days off from work this week, and put everything on hold. It's been quite relaxing. Max has recovered more quickly than me, which is good. 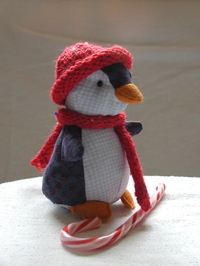 We don't have many Christmas crafts to show this year, and those we did do we quickly mailed away to meet the USPS priority mail deadlines, mostly without my taking pictures first. So I have a few pictures, but posting pictures is beyond me right now. I wanted to say thanks again to everyone who wrote in with encouragement for my ordeal, which of course turned out to be not even remotely as bad as I thought it was going to be. I got up on stage (with Max), played my piece, then left. No mistakes, mostly hit the notes right, didn't trip and fall off the stage. It felt pretty much like I was playing in my living room. Very anti-climatic. I was glad to find out that Max wanted to come up on stage with me. He brought his violin, then sat next to me with his teacher. I think it's great that he did that, it seems like such a small thing, but really it's not. I got this pin a few weeks ago at a craft fair. 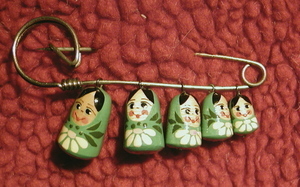 There was a woman selling things that had been handcrafted by women in Russia. This pin was among them. Little matryoshkas (Russian nesting dolls), all lined up. I'm really taken with them. At the craft fair I also saw some lampwork beads made by a local artist. Her beads were beautiful. I especially liked her bead holders in the shape of a frog and a monkey. Aren't they cute? I like how you can change the bead to follow your mood or your outfit. 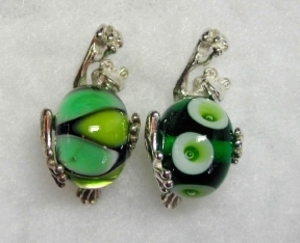 Now I just have to decide if I want a frog or a monkey, and which bead to get. Decisions, decisions. In other news, crafting is proceeding at a snail's pace because I must spend about an hour a day through next week practicing violin, a craft of a different kind. Why? Because somehow I've ended up signed up to participate in a violin recital next week. Let me explain the kind of sweaty-hands, jello-kneed response this provokes in me. As much as I hate public speaking, it is nothing--nothing!--compared to public performance of an instrument. Ack! I'll be performing that old violin solo standby, Twinkle, Twinkle, Little Star. It's the only song I know, because I just started lessons in September. Max is in Suzuki violin, so I'm learning too. But Max is not interested in public performance (smart guy! ), and since he's so young we don't want to push him. His teacher agreed about the not-pushing, and then let go with her bomb that I should play by myself. In a recital with the Suzuki kids. She said it would be good for Max to see me perform. Do you think it's good for a 4-year-old to see his mother cry on stage? I really can't imagine how it could be any more nightmarish than this. So in preparation, there's endless practice. Everyone, including the cats, is sick to death of hearing endless rounds of Twinkle. But I need to practice it until my FINGERS know it on their own, because my HEAD is going to be completely useless when the time comes. Max has been asking for a hat like Birdie Monkey has, and I finally got around to making him one. 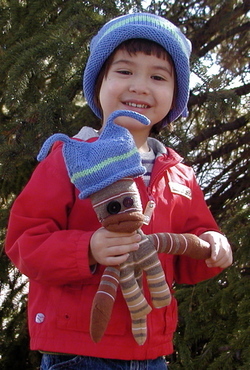 Here's a picture of Max and Birdie Monkey, with their matching hats. And here's one that shows the top of Max's hat better. In that last picture, he's working on making the hand sign for "love". They do a fair amount of signing at daycare, which is nice. 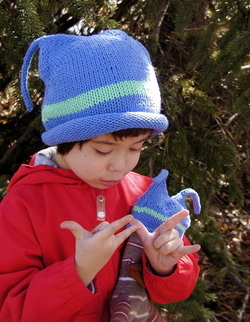 I haven't designed too many knitted things, but these hats are one of them. I'm working on the directions and will post them soon. I don't think I've ever explained the origin of the name of this blog. You probably won't be surprised to learn that it's named after my cat, not exactly an original idea. Here is the lovely Zhinka, nick-named Zhinka Dinka Doo, as well as Zhinka Padinka, Zhink, and the ever popular "hey you, get off the table!" Because we have four cats inside our house, and one or two strays outside, she's also occasionally known as "whatever your name is, and don't lie to me because I'll find out" (after an old Bill Cosby routine). 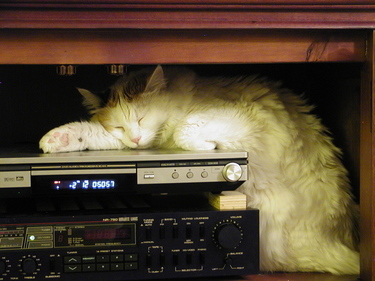 Since the weather has gotten colder, the cats have discovered the joys of the DVD-stereo cabinet. A stack of electronics, all behind a (partially) closed door, it's very toasty and pleasant in there. I'm worried about the ability of the DVD player to support of the weight of some of our heftier felines, but Zhinka is the svelte one and probably won't do any damage. It turns out to be very difficult to photograph white cats. Most of my pictures of Zhinka and our other white girl Comet come out looking like they have a variety of retro-reflectors taped to their fur, gathering all light within a 2 mile radius and directing it back toward the camera. So this was taken with a sleeping and non-moving cat, the tripod, and NO direct light. Zhinka is a calico with interesting coloring: all white body except for a colored patch at her shoulder blades, patches on her head, and a completely colored tail. She was found abandoned, pregnant, at work a few years ago so we took her in. She had kittens the next week. A friend took one of the kittens, and the local animal shelter found homes for the rest of them. She's a real sweetie, the quietest of our bunch. Zhinka is named after the impact crater Ragozinka in Russia. For a while we had a (nerdy) theme of naming our cats after impact craters (craters on Earth made by impacts by meteorites from space). We've gotten away from that recently, mostly because after Max arrived we didn't have time to figure out good names.